“I remember when a group of boys called me ‘dog’ repeatedly in 5th grade.” I’m not sure what prompted me to share this story with my kids, but before I knew it, the words escaped my lips. “Why? What did you do?” My daughter leaned forward, attentive. I watched her face process my response; disappointment at first, followed by empathy. Where was the hero to save the day, my happy ending? Except she’d been there too; turning the other cheek, putting up a brave face, lashing out in frustration at her tormentors. I wondered later why I didn’t select a moment of triumph. Why I didn’t choose a clear moment when good conquered evil. I could have been the hero of my own story, putting those bullies in their place, or magically becoming friends through my persistent kindness. Yet, I know my daughter is teased at school. One boy in particular has fully committed to three years of “just kidding.” Another girl, troubled by struggles at home, yo-yos between friendship and bullying, leaving confusion and dismay in her wake. We’ve done all we can as parents; encouraging her to speak up, talking to adults, and checking in to make sure she is doing okay. But I remember being the brunt of a hurtful never-ending joke. I recall walking home from school and hearing those same boys taunt me for being poor and push me in the mud. I never felt poor until that moment and determined to keep the incident from my mom. Except she saw the tear tracks, the mud, and the holes in the knees of my jeans. 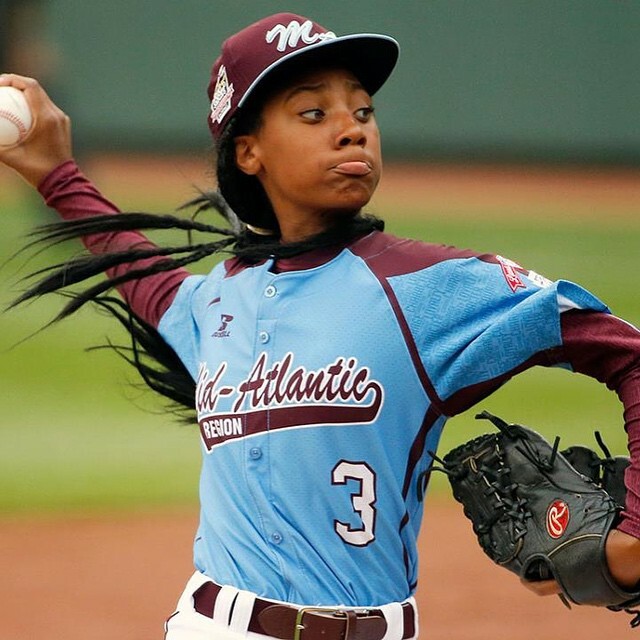 I introduced my daughter Mo’ne Davis, a brave, bold, talented young woman, who is also kind and gracious in the face of teasing. Mom made a phone call, much to my chagrin, and the boy’s mothers promptly put them on the phone to apologize. But Mom couldn’t erase their words or remove the memory of being pushed in the mud. She could stop the teasing, but she couldn’t take away the real source of hurt – the knowledge that those boys took pleasure from hurting me. She could support me, love me, and provide a refuge from the hurt. I then had to become the hero of my own story in a quiet, sometimes painstaking, way. I learned to not let their words define me, irritate me, or bring me down. I moved forward with confidence – sometimes just hard-earned bravado. Some days, I let their words in, reacted with biting words, or hid away. And it was hard, but it wasn’t forever. I want my daughter to know I’ve stood in her shoes and felt that hurt. I know she looks up to me and I want her to see that I’ve experienced bullying, too; that I’ve wondered when a hero would rescue me. And, while I can not stop her from ever hurting, I can support her, love her, and provide refuge. I can see her story beyond today and remind her that sometimes the hero of a story emerges later on – confident, unique, and courageous. Happy despite past hurt; perhaps kinder because of it. Photo Credit: Mo’ne Davis, People Magazine. This is so sad – as moms we want to protect our kids from everything, but I love how you said it – we need to teach them to become their own heroes no matter what. ” I learned to not let their words define me, irritate me, or bring me down.” <— that is key!! We should teach children that what other people think of us doesn't matter! We need to love ourselves! Let them know that they always have a safe place at home and are always loved by family and they can overcome anything! I think it’s brave of you to show her a moment in your life without happy resolution because we can’t always have that. And it’s our job to prepare our kids for real life and help them through those hard times.